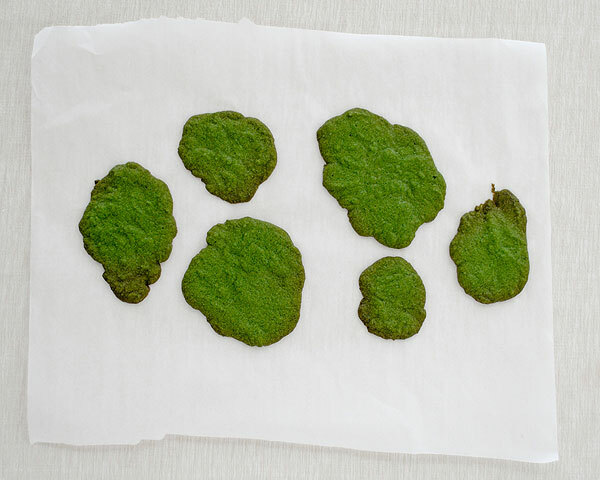 Cookie Moss Cake – how to make edible moss from cookie dough. 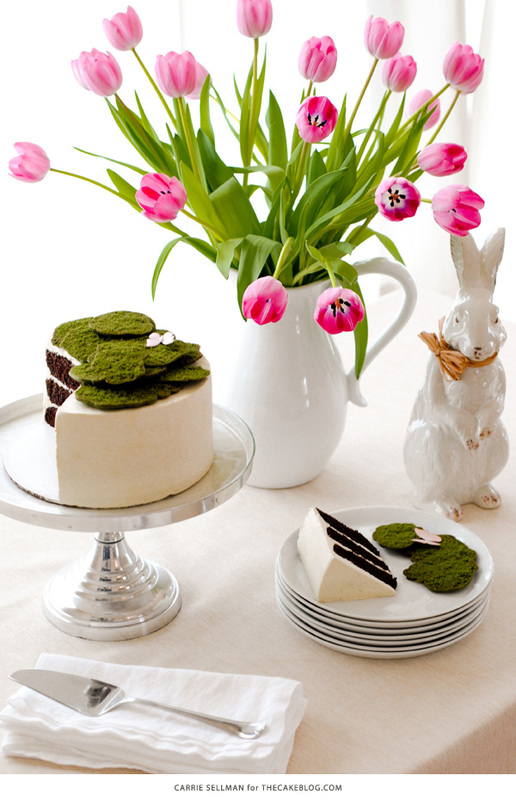 Top spring and Easter cakes, woodland cakes or a birthday cake for your favorite gardener! I absolutely love the look of real moss and find myself adding touches of green to every corner of my home. Maybe it’s because green is a symbol of life and renewal, commonly associated with spring and Easter. Maybe it’s because I’m obsessed with the modern farmhouse look right now, dreaming of a super white kitchen with calming grey walls and small pops green. Maybe it’s because I have actual moss sprouting up in my back yard — both in the grass and on this towering oak tree that I can see from my office window. Whatever the case, moss is popular right now. Just take a look around your favorite home furnishing store and you’ll see plenty of mossy goodness. 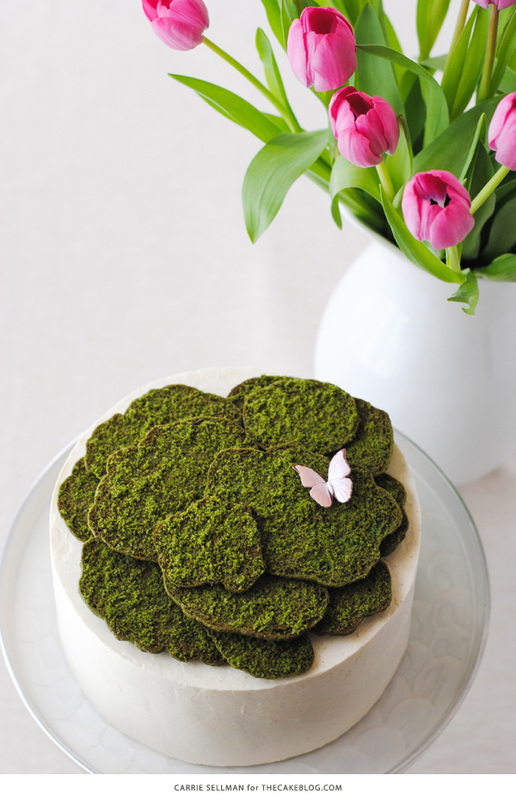 So, I thought it was about time for an edible moss cake! 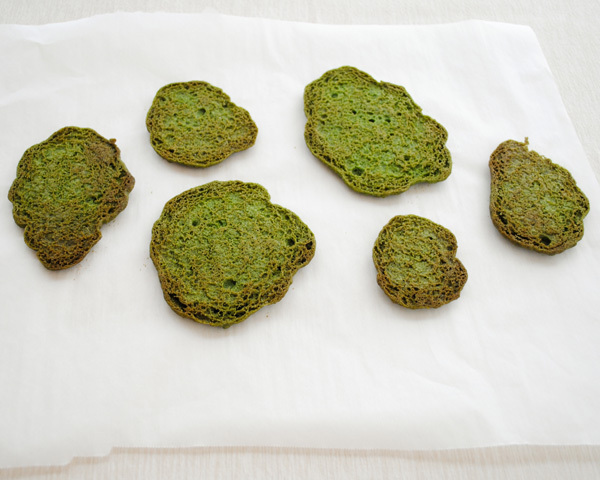 Now, I’ve actually seen a moss cake or two floating around Pinterest. While I love the look, they were made with real moss for photo shoot purposes. They look amazing but the last time I checked, real live moss is not something I want to eat. But the moss on today’s cake is sweet, crispy and not moss-tasting at all. That’s because it’s made with sugar cookie dough! 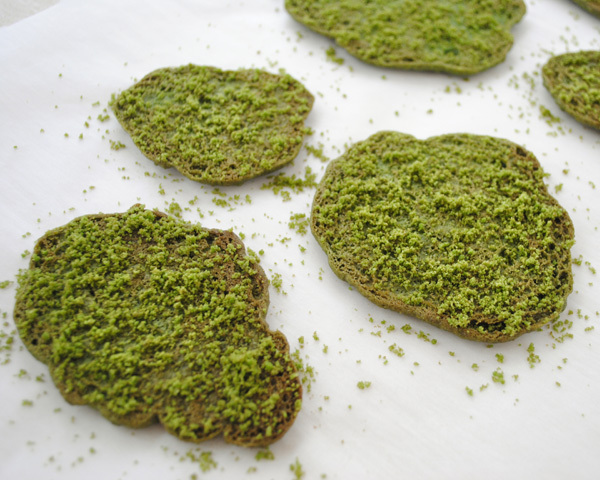 After about five test runs getting this moss exactly the way I wanted it, we had a whole mess of moss cookies sitting around the kitchen. Ironically, I found it odd that these cookies were not disappearing. It’s not like Mr. Sellman to leave cookies uneaten for days. When I asked him about it….. he fessed up that they looked too much like real moss! That’s when I knew that I had something worth sharing with you guys. Once Mr. Sellman was assured they were made with sugar cookie dough and only sugar cookie dough, they magically started to disappear. Because they just taste like sugar cookies! That’s what I call a win for everyone. This design works for all skill levels and time schedules. 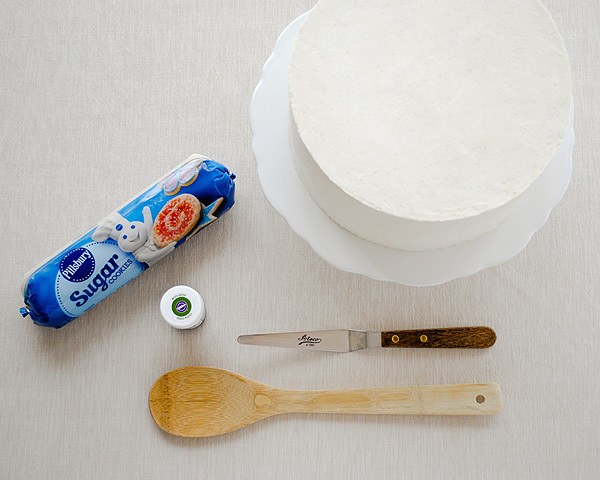 Make the cake from scratch using one of our recipes, bake it from a mix or simply purchase a plain cake at your favorite bakery. Then decorate it with the edible moss! In an effort to keep this project time boxed, I used store bought sugar cookie dough. 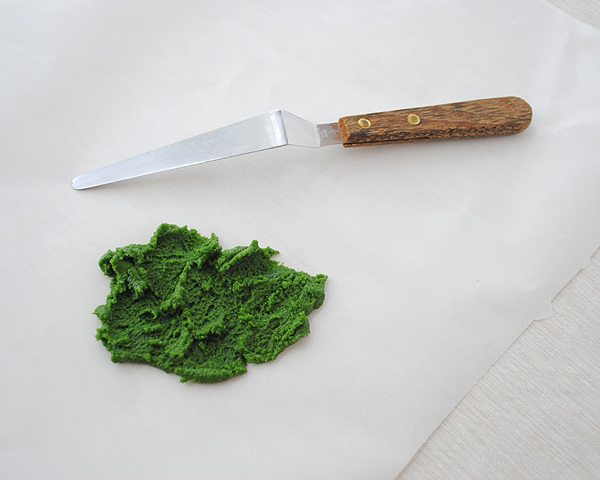 Yes, a prepackaged log of cookie dough is transformed into our edible moss topper! If you have a great cookie recipe that you want to use, go for it. If you want to get this beauty made and decorated in less time, use premade dough and never look back. The best part about this cake is that it works for a number of events. It can easily be the centerpiece of a bridal shower or a Mother’s Day brunch, even an elegant birthday. And of course it works for Easter! 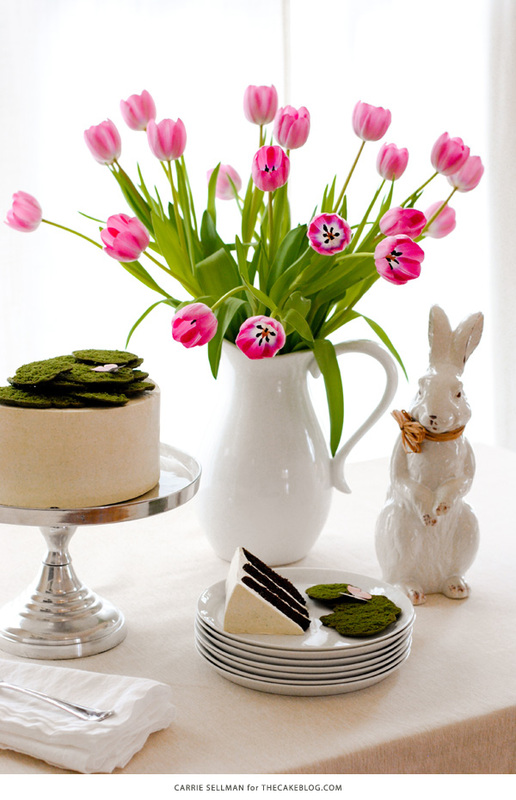 Just add some fresh tulips, a white ceramic bunny and you have a lovely Easter dessert table. Preheat oven to 350. Line a baking tray with parchment paper and set aside. 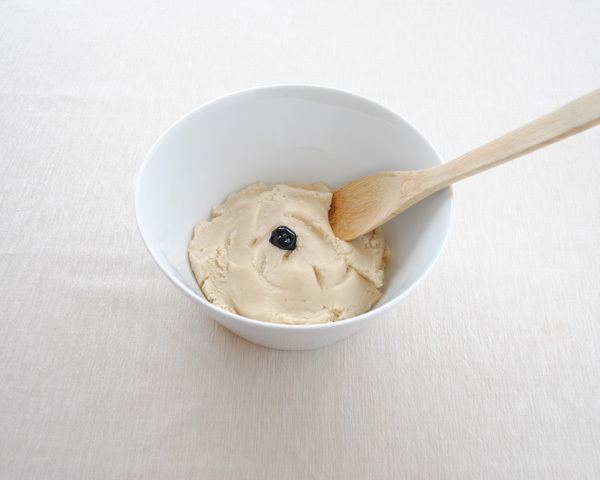 Place sugar cookie dough into a mixing bowl. 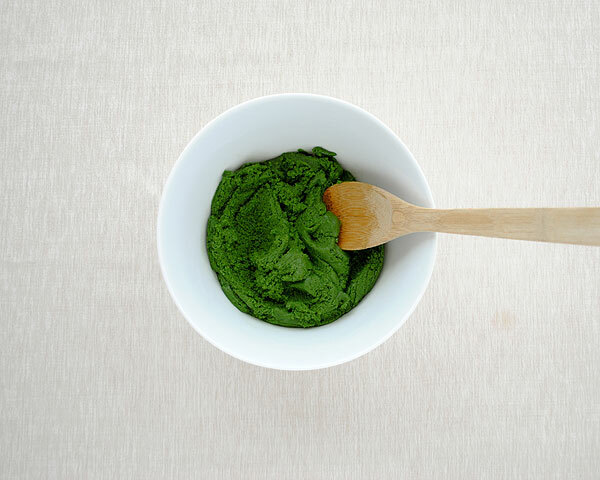 Add 1/4 teaspoon of the moss green food coloring. 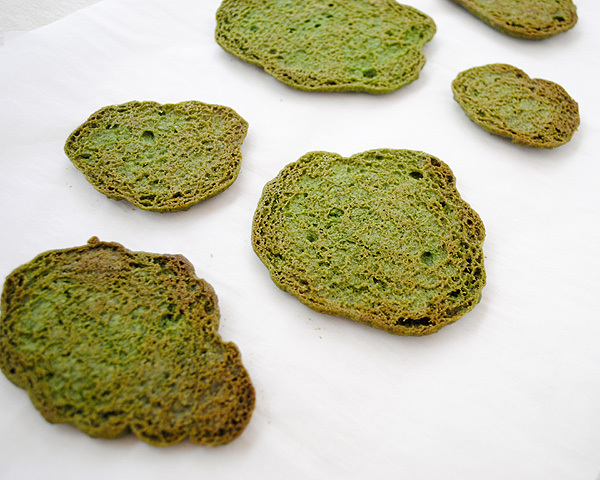 Mix the food coloring into the dough until it is completely combine and solid green. I found a wooden spoon to work best for this step. It did turn my wooden spoon green but it cleaned up in the dishwasher. Just something to keep in mind, if you’re really attached to your wooden spoon. Take a small clump of cookie dough and spread it thinly onto the parchment paper using an offset spatula. If you have trouble spreading your dough, rock your spatula back and forth and sort of scrape the dough off the knife and onto the parchment paper. It’s okay if it is thinner in some areas and thicker in others. We are going to intentionally leave it uneven. This is very forgiving and the idea is just to get a thin layer of dough into a rough shape. Leaving room between each cookie, spread additional cookie dough into various shapes and sizes until your parchment paper is full. Create big shapes, small shapes, circular shapes and oblong shapes. Bake at 350 for roughly 12 – 14 minutes depending on the size. You want the outside edges to be lightly brown, just like a sugar cookie. Remove from oven and let cookies cool. They don’t look like much right now, but trust me, we’re almost there. 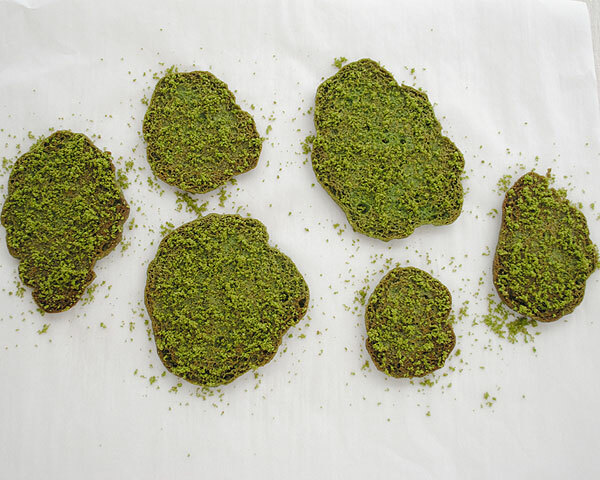 Flip cookies over to reveal the underside and its moss-like texture. You should have a little bit of brown around the edges with shades of green throughout. You could leave them just like this, but this next step makes them even more realistic. Take one of your cookies and crush it into super fine crumbs. You can do this with the back of a spoon or by placing it into a sealed ziplock and crushing it with a rolling pin. Be sure to get the crumbs super fine. Now sprinkle each cookie with the crumbs. 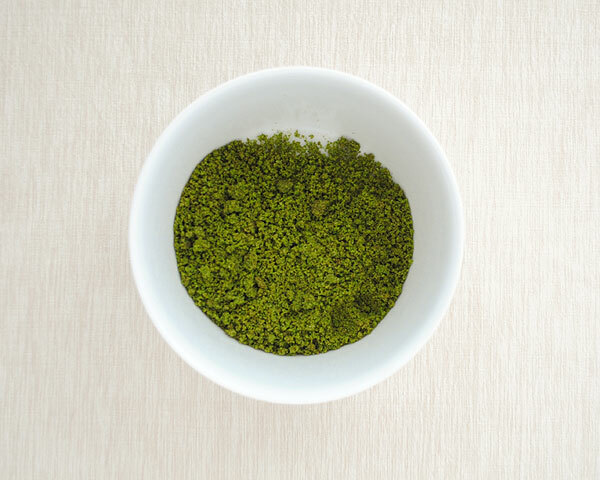 The crumbs will naturally fall into the little crevices and also sit on top, creating a great moss texture. It also adds a nice depth of color. Repeat this process to make additional batches of cookies. Vary your size and shape so that you have a good mix to use for decoration. You will have more than enough dough to experiment with a few batches to get the hang of the process. 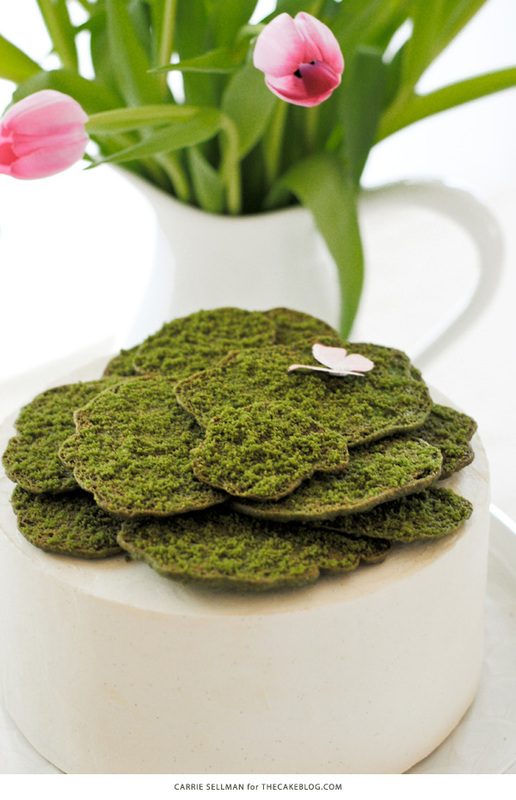 Once you have all of your moss cookies ready, simply stack them on top of the cake using the larger pieces on bottom and smaller pieces on top. Try not to turn the cookies over or you’ll lose your crumbs. I added a small paper butterfly as a finishing touch. 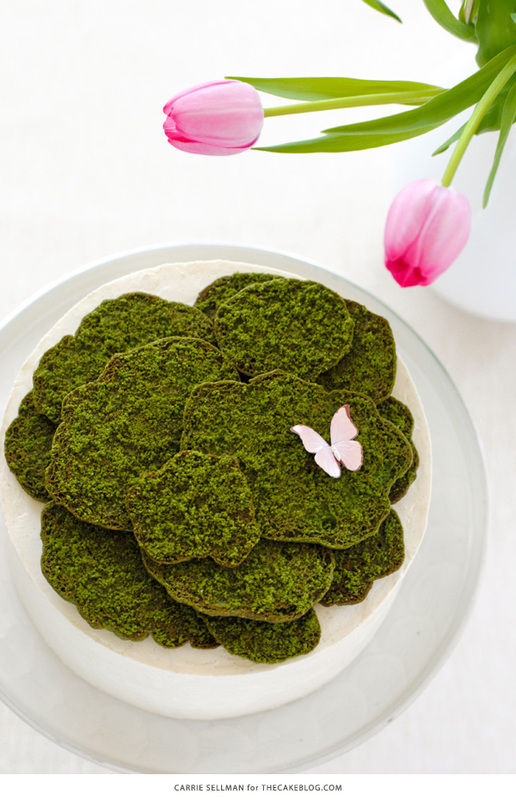 Use any extra moss cookies to decorate cupcakes or simply as a garnish on the plate for serving. Just . . . WOW! Thank you for this! I will use this always! Thank you Owen! You never know when you might need to make some delicious moss! O.M.G.! You are Mrs. Einstein. Just how do you become that creative? WOW – you are way too kind Paula! Hope you’re able to use this technique sometime. OMG This is great! Nice job Carrie!! Wonderful! Do you think a thin layer of thinned out royal icing in the same color as the cookies would work to hold the crumbs in place, without losing the mossy look? Sure, you could always give that a try Hali. I really liked the look of the crevices in the cookie, which you’d lose a little by adding royal icing. I didn’t really have a problem with the crumbs falling off because they kind of meld to the cookies, especially after being in the refridgerator with the cake. But definitely give it a try if you are concerned. Sure, this would work as well! Thanks for the suggestion Liz! somewhere today I saw a bunny that looked like he was covered in moss, I wonder if they used this method by crushing the cookies and adhering to the bunny. Do you think that would worke if the bunny cake was covered in buttercream or Ganach ? Hi Margie. I haven’t seen the bunny cake so I’m not sure what method they used. If you want to share a link, I could take a look. Wow! This is brilliant! It looks so much like real moss. Really clever idea. Thank you for sharing it! Thanks Shari! Hope you give it a try sometime. This is genius! I love it! WOW – thank you Kim! Hope you find lots of new cakes to love here. Brilliant! I could have used this quite a few times! I will Pin for future use. Thanks Erica! Always good to have a moss tutorial in your back pocket. lol. Awesome cakes. Just no words to express. So innovative! 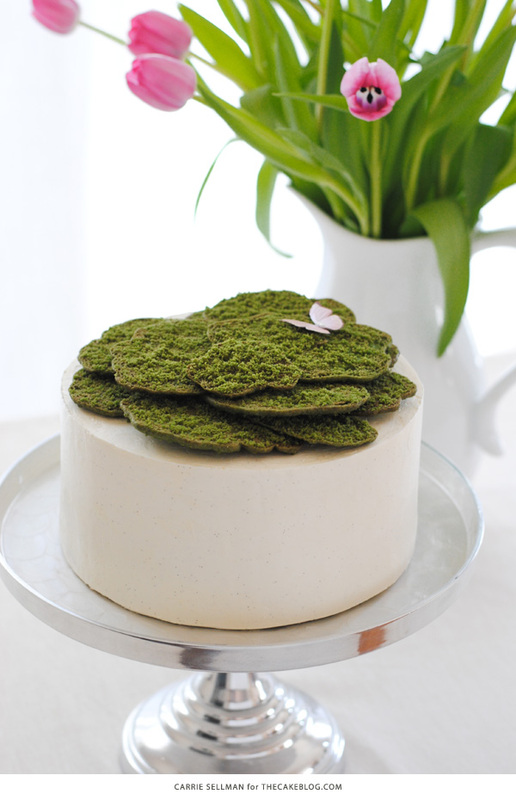 Might be cute to do a giant moss cookie and put the cake on top of it? Just a though. Thanks for the creativity! Thanks Lee Ann! 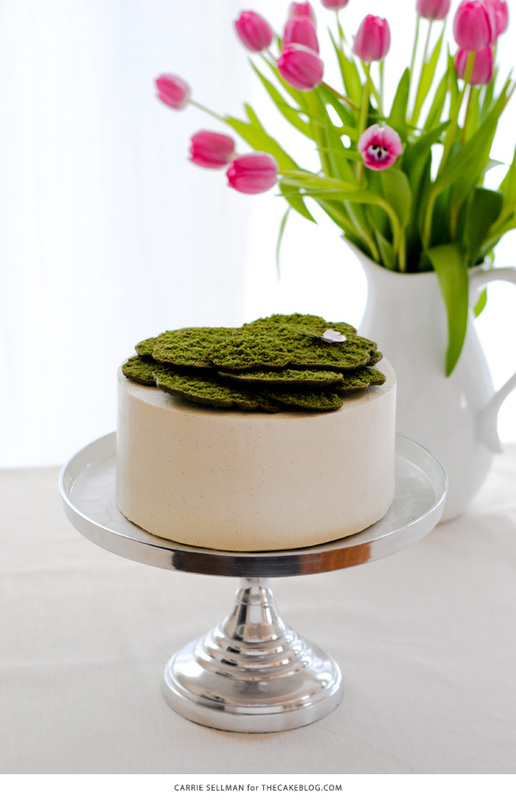 I love the idea of a cake resting on moss. These cookies are kind of crisp, so I think the weight of a cake would probably crush it. But you could certainly place a bunch of smaller cookies around the base of a cake, which would create a similar look. Let us know if you give it a try! Thanks Ryan! This ‘moss’ is actually quite tasty too! Awesome cake. I saw a cake at Monginis online cake shop. It was very awesome, after that one this is the second awesome cake I saw. You are just Brilliant. I hope your cakes go viral. WOW…..I hope to one day become as skilled as you are. Your are so incredibly amazing. Much fun to do and see it come together. Love it! I am going to make a fairy garden cake and have trying to figure how to make realistic moss as I want this cake to fool alot of doubting toms. I will try this and see if this will give the look I want without using fondant,Of which I do not like. Wonderful Bonnie! I hope this works for your fairy garden cake! No fondant needed! After searching and searching but couldn’t find the right words to search for, fondant moss popped into my head and your tutorial was perfect for what I am creating. I will be working on a edible miniature garden cake inside an edible suitcase, for the upcoming fair. Thank you! So glad you found my tutorial helpful Allissa! Your fair cake sounds amazing! Good luck! These are so freakin’ gorgeous! I have shared this on my Magical Things Fairy Day Roundup post. Thank you so much for this, it looks so real! 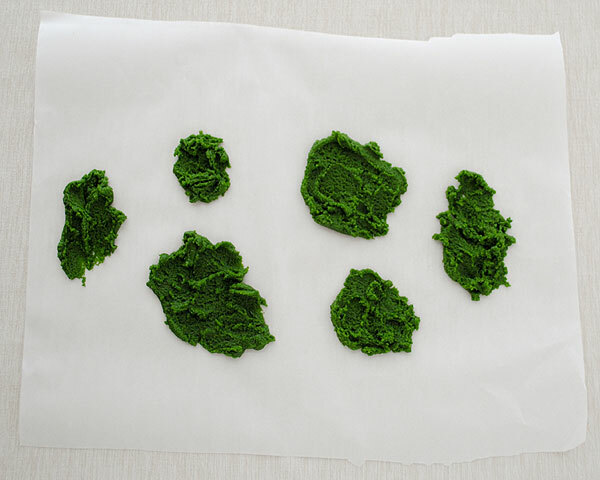 I’ve been hunting for a recipe to use for my son’s first birthday…his name is Moss! Do you think I could use this cookie crumb as a covering for a cake instead? Wow. These are amazing. YOU’RE amazing. lol. I am going to try this since I’m planning an enchanted forest party for May. Thanks for sharing.